Image Archive: The SL-1 Reactor Accident - SL-1 reactor being removed from the reactor building. The 1961 SL-1 Reactor Explosion was the world's first fatal nuclear accident. 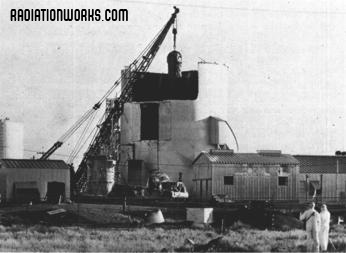 The SL-1 reactor complex was dismantled and buried in unlined trenches next to the site. High radiation levels required workers work in short, rotating shifts to complete the work. The top of the reactor building was removed using tools mounted on a crane to minimize radiation exposure. This photograph shows the damaged SL-1 reactor pressure vessel being removed from the debris.